I had always wanted to help the environment in a big way. From an early age, I loved spending time in nature and I was fascinated by how it all worked so perfectly. I also had a very strong affinity with animals and often considered them more like my friends than many people. Even as a child, I could see how the damage humans were doing to the earth was not only unfair for the environment and all its inhabitants, but unsustainable for the human race too. I couldn’t understand how people could be so ruthless and short-sighted. Never having been one to shy away from my passions, I embarked on a career in environmental management to try and do something about the mistreatment of nature. I studied environmental science and worked in various corporations, trying to get them to do right by Mother Earth. I even completed a doctorial study on how organisations could lessen their environmental impact. Many of my efforts while working in those roles were fruitless and fell on deaf ears. It became apparent that most companies only hire environmental professionals in order to fulfil their legal obligations and maintain a licence to operate. Trying to get them to do anything more than what they legally had to that was a waste of energy. All of this made me realise that nothing was ever going to change in regards to how society, as a whole, treated the environment unless we started to appreciate it more. It made me think of how indigenous populations across the world appreciate and respect nature, and how that is what makes them sustainable cultures. I wondered if western society could ever be more like them. To do that, I figured people needed to understand exactly how much the environment does for their mental, physical and spiritual health every single day. If they knew that, there is no way they would take it for granted, I thought. That’s where the book started – trying to help people see how nature supports us in so many different ways. Once people understood this, I figured they would then need to understand how to treat the Earth better. There’s no point telling people that they need to change their ways without telling them how. So I made sure the book was full of practical advice on how we could all treat the planet better on a daily basis. Not average advice either – the advice I give in the book is not what you’d find on any ‘eco tips’ list. That’s how ‘Earth Healing: Healing the Earth to heal ourselves’ came about. I sincerely hope it goes some way in changing the way the masses see and treat the Earth. Mother Earth does so much for us and it’s time we start doing something in return for her. We desperately need to start changing our ways – the existence of the human race depends on it! 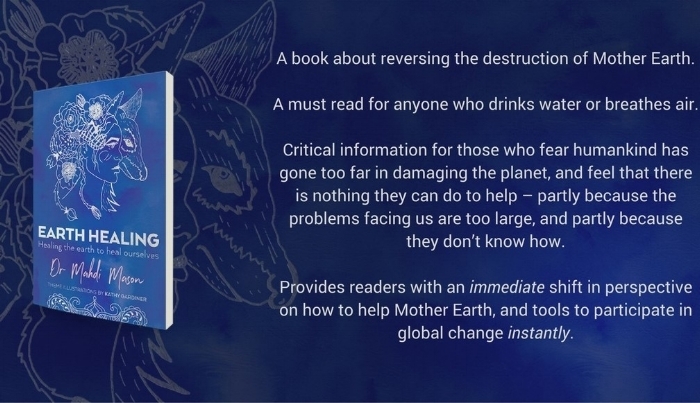 ‘Earth Healing’ will be released globally 27 October from all leading online book retailers. Older PostWin a Free Property Healing!